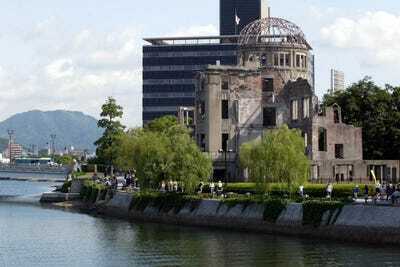 Koichi Kamoshida/Getty ImagesThe A-bomb Dome, which survived the 1945 atomic bombing on Hiroshima. Hiroshima today looks completely different than it did 73 years ago. On August 6, 1945, the US dropped an atomic bomb on Hiroshima that destroyed most of the city and instantly killed 80,000 of its citizens. Today, Hiroshima has recovered into a bustling manufacturing hub with a population of 1.1 million people and counting. Here’s what Hiroshima looks like today. On August 6, 2018, the 73rd anniversary of the bombing of Hiroshima, the residents of the Japanese city will pause to remember the day in 1945 that changed the course of history. On August 6, 1945, the US bomberEnola Gaydropped the first atomic bomb ever used in military combat on Hiroshima. The Allied forces dropped a second atomic bomb on the city of Nagasakithree days later. The device that explodedoverHiroshimadestroyedabout two-thirds of the city’s structures in a blindingflashof light. At the time, Hiroshima’spopulationwas approximately 300,000. The atomic bomb immediatelykilled80,000 and injured 35,000 more. By the end of 1945, 60,000 more people had died as a result of the blast. Today, Hiroshima is a prosperous manufacturing hubwith apopulationof over 1.1 million. Almost 70% of buildings in Hiroshima were demolishedin the blast. The skeleton of theHiroshima Prefectural Industrial Promotion Hall, located only about 175 yards from the bomb’s hypocenter,stoodstarkly among the rubble and became a symbol of the devastation. Junko Kimura/Getty ImagesThe Atomic Bomb Dome at the Hiroshima Peace Memorial Park on July 27, 2005. TheHiroshima Prefectural Industrial Promotion Hall, a multifunctional building created in 1915 that was used for research and design consultation,was one of the few buildings left standing after the blast. 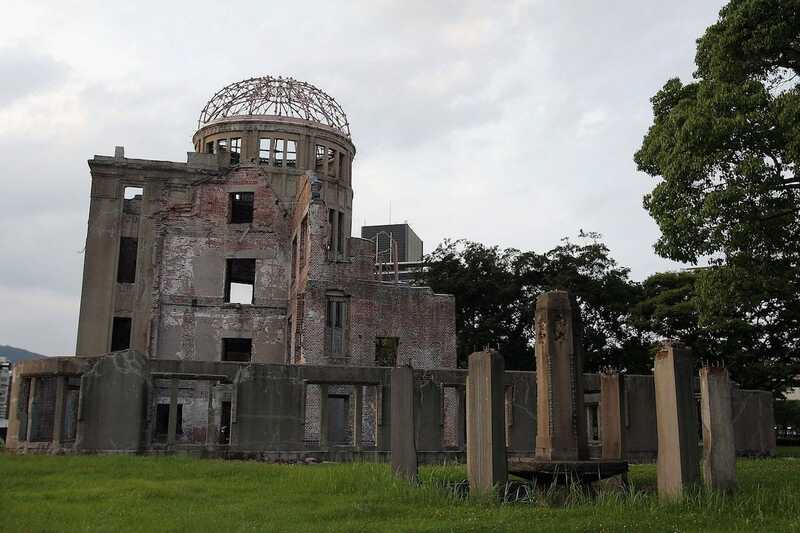 Now a part of the Hiroshima Peace Memorial, theAtomic Bomb Dome,orGenbaku Dome, is a UNESCO World Heritage site. The heat from the atomic blastburned lasting shadowsonto walls and pavements in the shapes of the objects in its path. 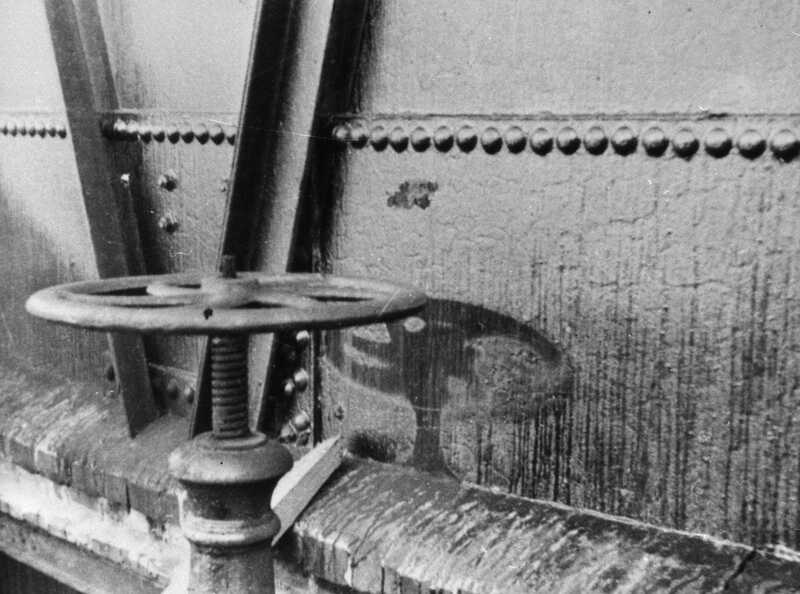 The most haunting Hiroshima shadows are the outlines of victims who were going about their daily lives when the bomb was dropped. Today, some shadows aredisplayedat the Hiroshima Peace Memorial Museum. Sites in Hiroshima often draw peace activists. In 2005,Greenpeacemembers launched inflatable doves in front of the Atomic Bomb Dome on the day before the Hiroshima anniversary. 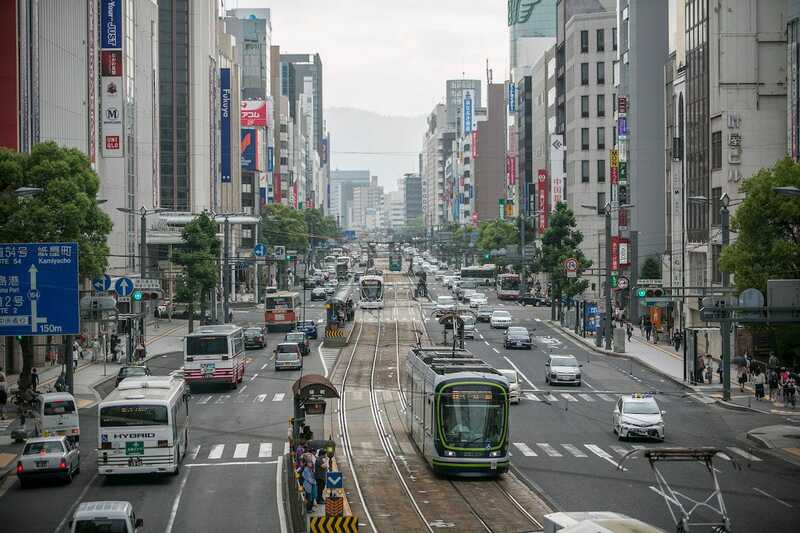 The routines of daily life in Hiroshima are much like any other large city in Japan. Visitors can enjoy okonomiyaki, a savoury pancake the Visit Hiroshimawebsitecalls “Hiroshima’s soul food,” while exploring the city’s livelynightlife. The city has launched a forward-looking planning process calledHiroshima 2045: City of Peace and Creativity, with a focus on designing a modern, distinctive urban landscape. Still, thememoriesof the past are never far away. Hiroshi Harada, pictured in 2015 in front of thecenotaph, or memorial for those who died, inPeace Memorial Park, built near the epicentre of the 1945 bombing. Harada is a hibakusha, which is a term for survivors of the Hiroshima and Nagasaki bombings, and a former head of theHiroshima Peace Memorial Museum. 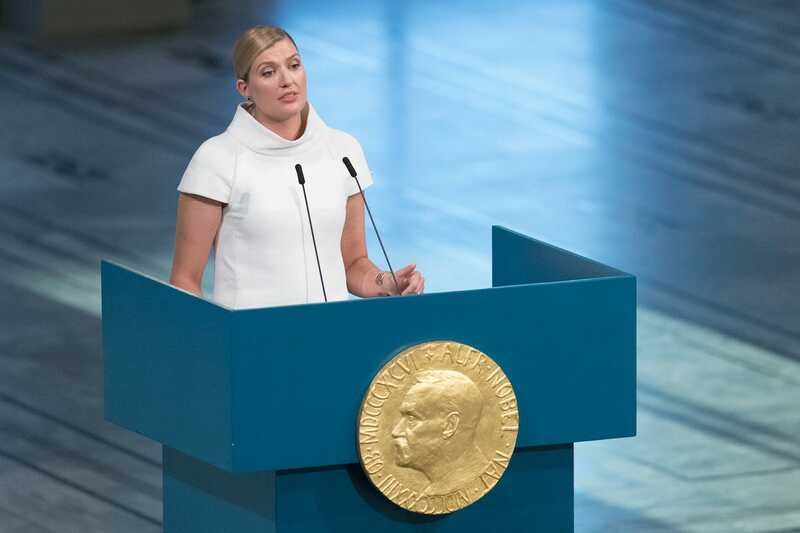 Nigel Waldron/Getty ImagesBeatrice Fihn, the executive director for ICAN, delivers acceptance speech for winning the Nobel Peace Prize 2017. In 2017, the International Campaign to Abolish Nuclear Weapons (ICAN) won theNobel Peace Prize. Setsuko Thurlow, a hibakusha, gave a movingacceptance speechfor the group in Oslo. 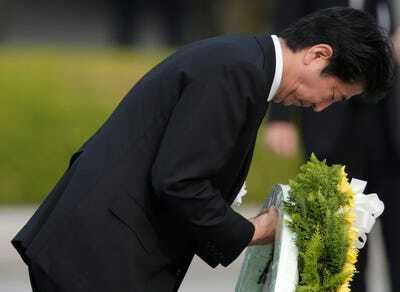 Yuya Shino/Getty ImagesJapanese Prime Minister Shinzo Abe. Japanese Prime Minister Shinzo Abelays a wreath during the Hiroshima Peace Memorial Ceremony at Hiroshima Peace Memorial Park on August 6, 2016 in Hiroshima, Japan. In 2016, Barack Obama became the first sitting US president totravel to Hiroshima. He laid a wreath during a ceremony at Peace Memorial Park with Japanese Prime Minister Shinzo Abe and greeted Hiroshima bombingsurvivors. 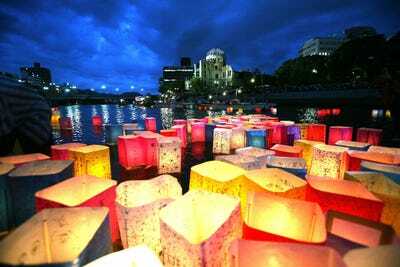 Junko Kimura/Getty ImagesCandles and paper lanterns float on the Motoyasu River in front of the Atomic Bomb Dome at the Peace Memorial Park, August 6, 2007. In Hiroshima, on August 6, church bells ring at 8:15 am, the exact moment the bomb dropped. That begins a day of remembranceceremoniesthat culminates in the hauntingly beautifulToro Nagashifestival, where hundreds of lanterns are floated down the Motoyasu River, in front of the Atomic Bomb Dome. Toro Nagashi began in Tokyo in 1946, andHiroshimapicked it up the following year. The lanterns are a tribute to those who perished in the bombing and an assurance that Hiroshima and the world will never forget what happened there on August 6, 1945.